With Packet listed as a partner on Azure direct connect portals, once an interconnect is purchased, Azure generates a pairing key. The pairing key generated by Azure is then used by Packet to enable the interconnect to the Azure endpoint. Users can then create the interconnect for that VLAN with the desired port speed. Packet limits this service to 12 Interconnects per customer. Name of connection: A descriptive name used only on the Packet side to help differentiate between multiple circuits. VLAN Location: Select the location you’d like the virtual circuit to be created on the Packet side. This must match the location selected on the Azure peering location when creating the ExpressRoute on their side. Port Speed: This needs to match the exact speed you configured when you setup the ExpressRoute link. If it doesn’t match, the connection will not work. Packet VLAN: The VLAN you created in the customer portal under IPs and Networks > Layer 2 that will provide access to the Packet Connect circuit. Express Route Key: The key provided during your setup of the Azure ExpressRoute circuit. 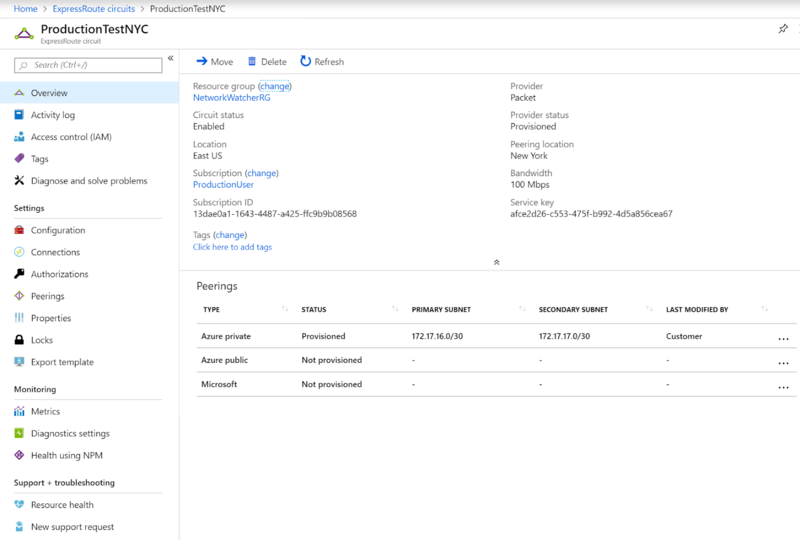 Once the Packet Connect virtual circuit is established, you can now configure BGP from a server on the Packet side to peer with the Azure routers as described here or link a virtual network here. Virtual Network: To connect the virtual network to your expressroute circuit, you must first create a Virtual Network Gateway in Azure that connects to the Virtual Network(s) and is connected to the ExpressRoute circuit. Azure VLAN: In the Azure portal under the ExpressRoute circuit and Peerings the only supported VLAN currently is 2. You can use this for either the Azure private, or Azure public peering, but only 1 at a time. Azure Peering IP: Currently only the primary Azure connection is built, so when choosing the peering IPs, the server acting as your gateway will only need the Primary subnet attached to its layer2 interface. Microsoft uses the 2nd IP in the /30 and you’re assigned the first IP in the /30 that you choose. Termination: You must first delete the circuit on Packet portal. In order to delete it via the Azure site.